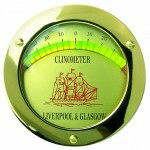 A bulkhead mounted clinometer for determining angle of heel on sailing craft. 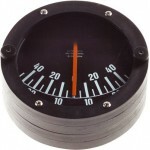 Diameter: 110mm Thickness: 40mm..
Brass-cased bubble inclinometer with three mounting holes for fixing to a bulkhead.Diameter 11cm.. 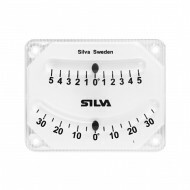 Indispensable for measuring the optimum angle of heel, for racing dinghies and larger yachts. Designed to be mounted inside or outside. 45° heelmeter 5° graduation, up to 45° Adhesive backing Size: 90 x 40 mm .. 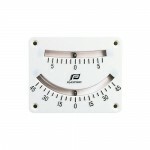 Indispensable for measuring the optimum angle of heel, for racing dinghies and larger yachts. Designed to be mounted inside or outside. 45° heelmeter 5° graduation, up to 45° Mounted via 4 screw holes (screws not supplied) Size: 110 X 82 mm .. 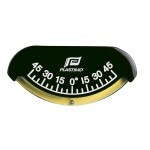 This popular clinometer is suitable for all types of vehicles. 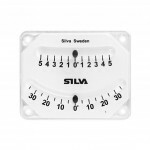 The Silva Clinometer is used on sailing boats for checking the angle of heel and on powerboats for the power trim check, but is also a perfect working instrument for other applications such as making sure that different equipment/vehi..